How much of Pablo Larrain's film NERUDA is fact and how much is fiction? That's the wrong question to ask. 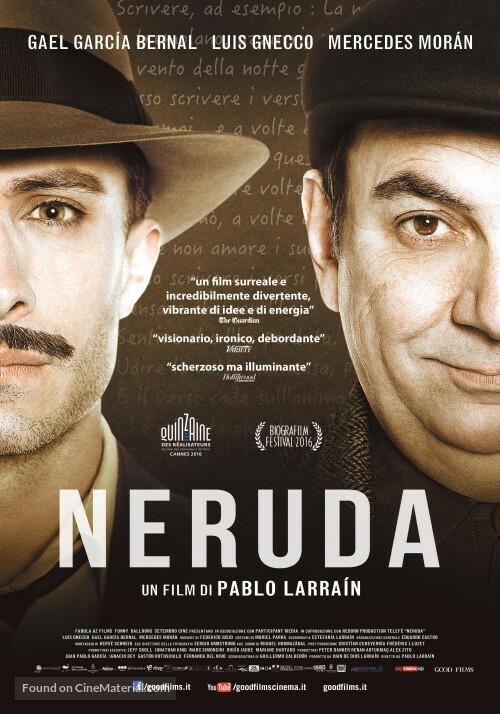 Written by Guillermo Calderón, NERUDA is loosely based on a period in the life of Chilean poet and politician Pablo Neruda (Luis Gnecco) when he was forced into exile. The film is fittingly poetic, and less concerned with literal truths than emotional ones. And while the basic details of who Neruda was and what he did are sketched out herein, NERUDA plays more like a fantastical detective thriller than a traditional biopic. The plot is set in motion when, 3 years after the end of World War II. Neruda is a senator, and although he originally supported Chile's President, he is now one of his most outspoken critics. When the President begins cracking down on communists, Neruda realizes it won't be long before they come to throw him in jail. He knows he'll have to run but says, ""I'm not going to hide under a bed. This has to become a wild hunt." And indeed it does. Neruda and his wife Delia (Mercedes Morán) are pursued by police inspector Óscar Peluchonneau (Gael García Bernal). This sits quite well with the poet, who is a fan of pulpy crime novels and relishes the idea of having a dogged adversary on his trail. It would all make for a fun caper film if it weren't for the fact that many less famous Chileans are being rounded up and placed in prison camps. Director Larrain fully embraces the fact that his film has little interest in realism or strict historical accuracy. Every shot is covered by a purple haze, if you will, sending a subtle message that what we see has at least one foot planted in the realm of fantasy. That's further driven home by touches like the film's many driving scenes, which utilize the old fashioned Hollywood technique of rear projection and make little attempt to be convincing. As for the portrait the film paints of Neruda himself, it's a complex and not entirely flattering one. Larrain obviously has great respect for Neruda as both an artist and political activist, but he doesn't shy away from showing him as a hedonist who is often out of touch with the working class people he claims to represent. Peluchonneau, who is the film's narrator, is not easy to pin down, either. Is he on equal footing with Neruda as the film's co-protagonist, or just a supporting player destined to be forgotten? All is resolved in a satisfying conclusion that, like the rest of NERUDA, is artistic without being obtuse. 4 out of 4 stars.